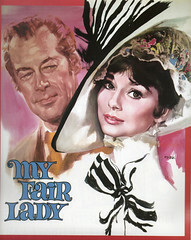 ‘I’m an ordinary man’ sings Henry Higgins in My Fair Lady, ‘who likes to live his life free of strife. But let a woman in your life and your serenity is through’. Imagine if you will, the CBSO Chorus’s associate conductor Julian Wilkins as our ordinary man, whose strife this week has been caused, not by a woman, but by last night’s (very successful) Lerner and Loewe concert. I’ve always thought the life of an associate conductor is a difficult one. In smaller choirs I’ve sung in, the appearance of a different conductor for rehearsals was a rarity, but tended to be greeted with an undercurrent of grumbling. Choral singers are creatures of habit. We like to know what we’re getting and can get peeved by the simple addition of an unfamiliar warmup exercise, never mind a different face at the front of the rehearsal. The CBSO Chorus is slightly different, in that if you wanted to get our Chorus Director Simon Halsey to all our rehearsals you’d have to indulge in a spot of cloning, as his schedule involves juggling about five different jobs in more than one country… Thus we’ve grown accustomed to Julian’s face as he has taken charge of some of our concerts, including this latest one. As we arrived at the first rehearsal it was clear that getting the music together had been a challenge. Poor Julian was operating on no sleep, as he’d spent the night going through the scores, marking them up so that we knew where to breathe and where to place our ‘t’s. For any non-singers wondering why on earth a person would want to do that, it’s the difference between understanding what the choir are singing, and thinking there’s a machine gun battery in the room as ‘t’s explode everywhere. Choirs spend more time on this than you’d think. Now, rehearsing this type of music is very different from our usual repertoire. It can be difficult. Particularly if you’re lacking in instructions from the actual conductor of the concert. Once you’ve sorted out which notes you’re singing when, it all becomes a bit vague, as you try and work out at what speed or dynamic someone else is going to want a particular phrase. Normal rules don’t apply. The music is not to be followed slavishly and you need to watch out for repeats, cuts and soloists who are doing what they like. I particularly enjoyed the instructions on dynamics. Take the organist’s approach – do it loudly and with confidence until someone tells you otherwise (something Julian himself has been known to demonstrate when let loose on the Symphony Hall organ…). Tempo is almost impossible to predict, so we opted for the rehearse many options approach. Which was fortuitous. John Wilson spends his life conducting these sorts of concerts and has a reputation for being pretty clear about what he wants, which is what you need when you’ve got about 3 hours to put together a concert with an orchestra, a chorus and 3 soloists, one of which is a last minute stand in. However, clarity of purpose on this occasion was not always translating to clarity of beat. There were discussions about exactly which part of him was denoting the pulse. A hand? An elbow? I’m pretty certain that it wasn’t the baton. To be fair, I think that, once he’d been reminded that choirs need to breathe, we’d pretty much cracked it by the end of the concert. In addition to this, you mustn’t forget the challenge of trying to get a classical chorus to sound like they’re from Hollywood. I think that’s the first time we’ve been asked to sing with more vibrato. And to sound lustier. And while we often have excellent language coaches to help us, none of them have ever covered the Cockney dialect. Or singing with a slight Scottish accent. Don’t get me started on the whistling. Julian was ever encouraging in our attempts to perform these showtunes, from grinning at us in an attempt to get us to smile, to Scottish dancing on the sidelines. When we hold orchestral rehearsals in the CBSO centre it can be a bit of a nightmare. We usually find ourselves sitting miles away from the conductor, if we stand up to sing half of us can’t see and instructions are passed along like Chinese whispers as we can’t hear much either. This one didn’t start well, with a scheduling miscommunication meaning that Julian had to hold an impromptu rehearsal with the chorus while we waited for the conductor to finish his dinner. Once we started, the fun really began. Owing to the acoustic in the hall, we always sound late to the conductor. This is where our associate conductor really earns his money, running between chorus and conductor, encouraging and soothing in equal measure. It’s a challenge to make the choir feel happy, when you’re telling them to sing ahead of a beat they’re struggling to follow, while we all know that really we’re singing in time. This while reassuring the conductor that it really will be alright on the night, and that the move to Symphony Hall will sort out many of the timing niggles. To top it all off, we get to the concert and you think that Julian deserves a rest. He’s put in all that hard work, we sound great, we almost know what we’re doing (allowing for surprises), and he can sit back and relax. No, not Julian. Instead, he opts to join the tenors and sing his way through the evening, before legging it onstage to take his well deserved bow. So this week, our associate conductor, pianist and singer may have felt his serenity was challenged but he has truly been an ordinary man doing an extraordinary job. Thank you.